New York | You're History! The staff of the Webb Deane Stevens museum in Wethersfield, CT, gathered together a while back for a rare, and most enjoyable, field trip to the scenic Hudson River Valley, a region of outstanding natural beauty and historic significance. Our first stop was Constitution Island, located on the river within view of West Point and part of the military academy itself. 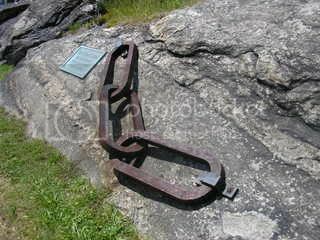 The Island is most famous for the Great Chain that was placed across the Hudson during the Revolutionary War, to prevent British ships from navigating this strategically vital stretch of the river. No military action was to take place on the fortified island, which was the first fort built by the newly-declared independent Americans. Interestingly, it was named “Constitution” to remind the British that America was due the same rights as England under the English constitution. The US Constitution had yet to be written. The 230-year-old house that stands on the island today began as military barracks. In 1836, it became the residence of the Warner family. Susan and Anna Warner were well-known authors in the nineteenth century, producing over 100 books between them. Susan wrote The Wide, Wide World in 1850 which became a best seller of its day. Anna is best known for writing the words to the hymn Jesus Loves Me. The sisters taught Bible classes to West Point cadets for forty years, entertaining such well-known soldiers as Dwight D. Eisenhower and Omar Bradley. The house was enlarged by the Warners, and contains a large collection of their furnishings and other belongings, including albums full of photos of handsome young cadets. Now a museum, it is maintained as closely as possible to its appearance at the time of the death in 1915 of Anna. A slide album of highlights is presented below. 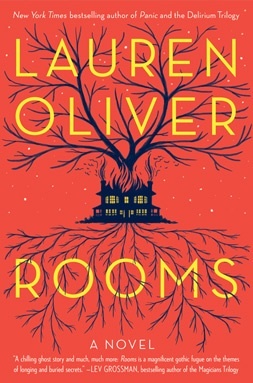 Already well known as a successful writer of young adult novels, Lauren Oliver ventures into the adult market with Rooms. Long estranged from their wealthy husband/ father, the Walkers return to their former home in upstate New York for his funeral. Each of them has brought a parcel of personal struggles along with their baggage, and in the days before the service, long buried memories bubble up to the surface, compounding their distress. Only one of the family, teenaged son Trenton, realizes that they are not alone in the house; two of the former residents, now long dead, have failed to move on. The stories and circumstances of each of the six main characters are told from their own points of view in a series of alternating vignettes. These play out within a specific room in the house, which accounts for the book’s title. These people are all interesting in his/her own right, and each is emotionally distanced from the others, locked in their own misery. Each is preoccupied with thoughts of their own deaths, and not merely because of the funeral. Their depression is palpable, and it’s easy to see why the ghosts have yet to move on. For me, the most compelling characters are Trenton, and the shades of Alice and Sandra, who were each in early middle age when they died. Yes, their capacity for denial and repression is strong, but these three have cracks in their armor into which slices of honesty keep filtering. Perhaps that is why Trenton senses, hears, and sees faint manifestations of the spirits, especially when they comment between themselves (sometimes humorously) about the Walkers. One of the most popular songs of 2014 is Let It Go, from Disney’s Frozen. One of the recurring tropes in Rooms is the phrase, “You’ve got to learn to let go.” This is a lesson that everyone absorbs during the last quarter of the book, in greater or lesser degrees, as they are forced by a series of unexpected shocks that turn what they thought they knew upside down, to confront the truths that are holding them in misery. Yes, there is reason to hope, even though none of us can entirely know another. It’s difficult to grasp the fact that Yoko Ono Lennon is 80 years old. Born in Tokyo in 1933, she and her parents moved between Asia and the US as demanded by the dictates of her father’s banking job. They were in Japan during WWII and suffered the deprivations common during war. In the early 1950’s, the Onos settled in Scarsdale, NY. Yoko attended Sarah Lawrence College, and to the dismay of her parents, embarked on a “Bohemian” life style as an artist. Yoko married a composer and attempted suicide after the marriage failed. In 1962, she married again, giving birth to a daughter, and despite marital strife, stayed with her husband for several more years, pursuing her career and leaving child care responsibilities to him. In 1969, everything changed for Yoko when she met John Lennon, who attended one of her art exhibits. Lennon was attracted to her avant garde attitude towards both art and life, but their relationship did not heat up for a couple of years. When their affair finally began, and Lennon divorced his wife, public outrage was enormous. John and Yoko married in 1969, at the height of the peace/love/drugs movement, and became the most famous couple in the world, demonstrating for their beliefs with flamboyance, via a bed-in, naked photos, appearing in public wearing bags, and other in-your-face antics. The Lennons were flattered by their inclusion on President Nixon’s infamous anti-American list. Lennon insisted that Yoko participate in his music, though she was not especially gifted in that area, and when the Beatles ultimately broke up, disappointed fans held Yoko responsible. The couple was widely criticized for their treatment of Julian, Lennon’s son from his first marriage. Yoko’s former husband, believing that Lennon was a harmful influence on his daughter, kidnapped her from Yoko’s custody and refused to permit any contact. Attempts were being made to deport Lennon for drug use, and for a time, the marriage foundered. The following year, Yoko and John reconciled, and their only child, Sean Lennon, was born. Shortly after the release of a joint album, John was murdered in front of their apartment at the Dakota in NYC. For years, animosity toward Yoko continued, but she never gave up her artistic and social endeavors. She created a memorial to John Lennon in Central Park, Strawberry Fields, and the John Lennon Museum in Japan. Yoko recently has instituted a $50,000 Peace Prize for Palestinian and Israeli artists. Now 75, Yoko Ono has finally been given credit and recognition for her artistic and political contributions, and has reconciled with her daughter. It’s tempting to wonder what her reception might have been had she been Caucasian and beautiful.